“WE’RE DOING A SEQUEL! That’s what we do in Hollywood. And everybody knows that the sequel’s never quite as good”. And with that joyous opening number we are introduced to the follow up to James Bobin’s 2011 gem, The Muppets. One has to wonder whether this is a sheepish warning or more likely, just another example of the Muppet franchise’s very self-referential nature. Bunsen also interjects that in fact, the current movie is the seventh sequel to the Muppets’ original motion picture, The Muppet Movie (James Frawley, 1979). I loved the 2011 reboot and had high hopes for the current movie. Unfortunately Jason Segel, star and co-writer of the previous film, was not involved this time around. I love his sense of humour and I didn’t feel that the current film was quite as hilarious. I chuckled a few times (most notably at the Chorus Line reference) but I didn’t laugh out loud at all. In the previous film I cried with laughter. 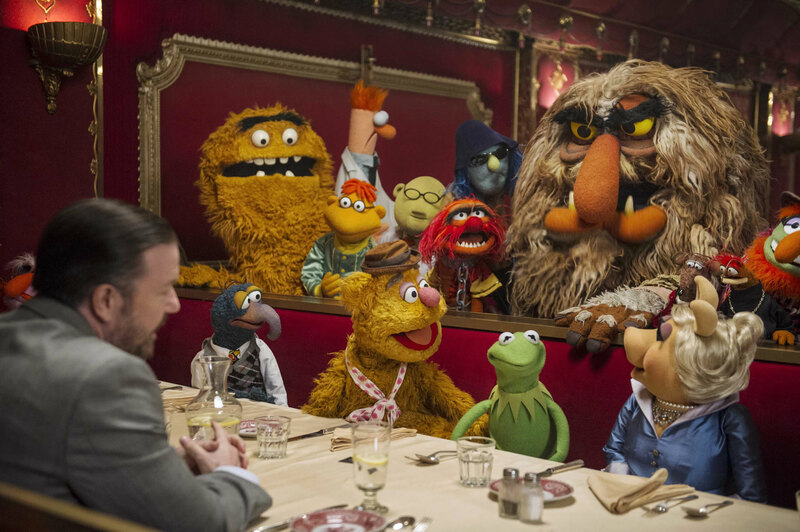 It wasn’t as adult friendly and the focus was much more on the Muppets themselves, although I’m sure there will be viewers who appreciate this. Personally, I’d be happy to just watch Jason Segel and Amy Adams all day. 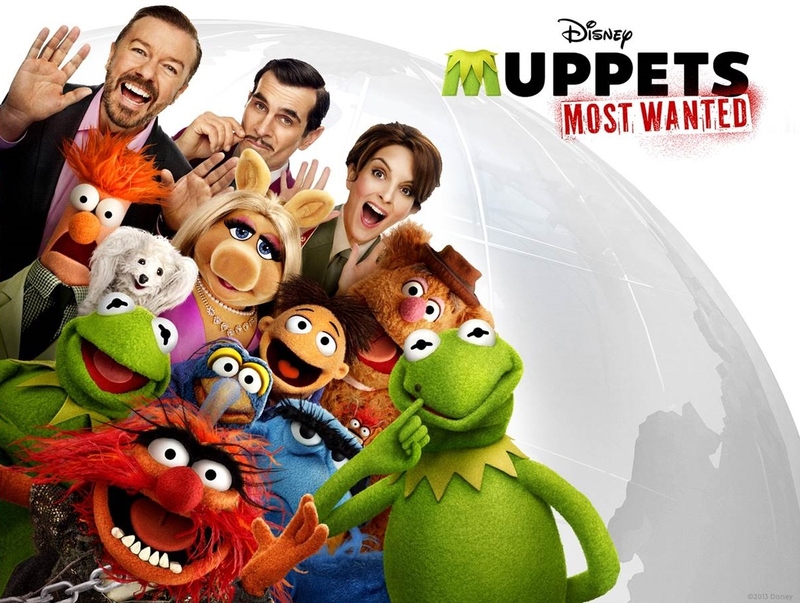 In Muppets Most Wanted, Kermit look-alike and infamous thief Constantine swaps places with Kermit in a bid to successfully steal the Crown Jewels from the Tower of London under the guise of a Muppets World Tour. He is assisted by his Number 2, Dominic Badguy (Ricky Gervais) who acts as the Muppets’ tour manager. As various museums and banks around the world are broken into, Sam Eagle and Inspector Jean Pierre Napoleon (Ty Burrell) investigate. Meanwhile Kermit finds himself in Siberian jail headed by ball-buster Nadya (Tina Fey). Constantine has a ludicrous faker than fake Russian accent which he then tries (with absolutely no success) to turn into an American/Kermity accent. Tina Fey and Ty Burrell similarly have terrible accents, however I think this was the point. Along with Ricky Gervais they hammed it up and didn’t take themselves too seriously. They all made for welcome additions to the Muppets family. Ty Burrell was my personal favourite. Of course in a Muppets film there were also plenty of celebrity cameos which are always fun. Without a doubt what really made the film was the music. Flight of the Conchord’s Bret McKenzie once again penned some terrific songs, with my favourites being ‘We’re Doing a Sequel’ and ‘The Big House’. The cast didn’t include any professional (read: good) singers, except one mystery voice who I couldn’t quite place until the big reveal at the end, but it didn’t matter. The tunes were great, the lyrics were funny, and they totally measured up to the previous film. 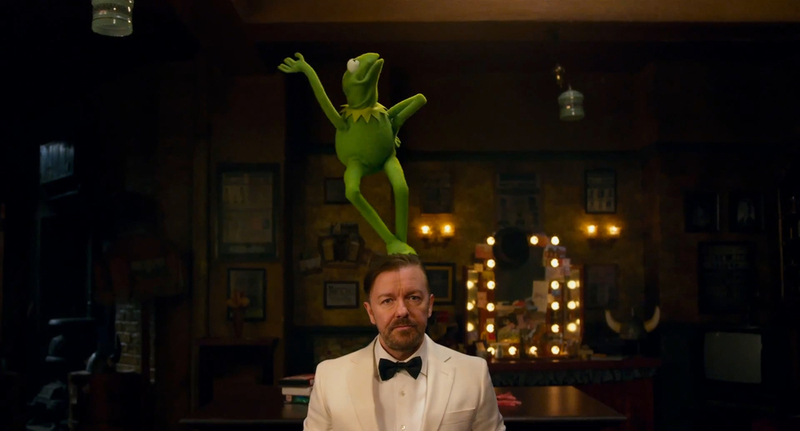 Muppets Most Wanted didn’t have that Segel humour, and Constantine’s awful accent was incredibly grating (and for the most part I didn’t find his character very entertaining at all), but it’s worth seeing just for the music. And the Chorus Line reference.